Provence lavender, sometimes referred to as French lavender, is a very fragrant, showy type of lavender species. It grows to 2 feet tall and spreads between 2 and 4 feet wide. Provence lavender produces long stems of grayish green foliage, and in midsummer the tops bloom into purple lavender flower stalks. Used as a culinary and crafting herb, the fragrant lavender plant stalks are also easily bundled for a dried floral display, making the plant a favorite among home gardeners. Select healthy Provence lavender plants at a reputable local nursery or greenhouse. The advantage of selecting them locally is that you are assured that they are adaptable to the local climate. 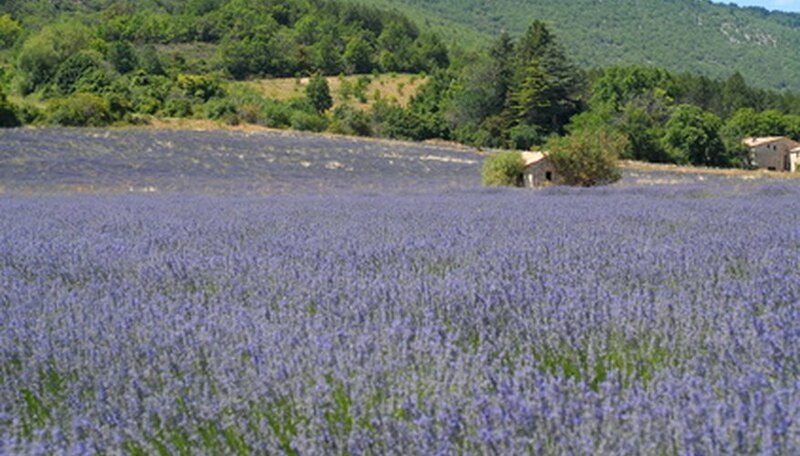 Select a location for your Provence lavender that has full sun and good soil drainage. You do not want to plant your lavender in ground that is often soggy. Loosen the soil, going 8 to 10 inches deep into the ground. If your soil tends to be moist, work in 2 inches of sand to increase drainage. Even the soil out after working it. Dig a hole for the Provence lavender plant that is the same size as the root ball. Add 1/4 cup of bone meal to the bottom of the hole, stirring it in with the dirt. Remove the lavender plant from its container and set it into the hole. Fill the hole in with dirt, making sure that the dirt is packed around the root ball. Water lightly, and then water only every three days after planting. Once the Provence lavender shows signs of growth and being established, you no longer need to water it, except in times of drought. Space Provence lavender plants at least 2 feet apart, in rows that are 3 feet apart. Harvest lavender stalks early in the morning, and dry them by hanging them upside down in bundles in a cool, dry area. Lavender will not stand for too much water, so do not over-water or allow water to stand on the ground near the plants.